Never in the history of IDF has Intel disclosed so much on the first day of the show. A couple of years back Intel shortened IDF from a four day event to a three day event, which made things a little more hectic but it also made the show more efficient. This time however, Intel not only kept the three day schedule but also crammed all four keynotes into the first day. Combine the four keynotes with our hands on time with Conroe and you can see how it was a busy day. The first two keynotes of the day focused on the desktop and the server markets, while the latter half of the day was focused on mobile. There are two main things to discuss when it comes to mobile technology at this Spring IDF: Merom and the Ultra Mobile PC (UMPC). Merom, as we all know by now, is the successor to Yonah (Core Duo). It is very similar to Conroe in terms of its architecture but will be shipping at lower clock speeds and lower thermal/power targets. We'll dive into the architecture of Merom tomorrow, but until then here's what we do know. Merom, like Conroe, features a 14-stage integer pipeline, up from the 12-stages in Yonah. Merom also happens to be a wider 4-issue core, meaning it can fetch, decode, execute and retire up to four instructions per clock (compared to 3 in Yonah). We mentioned earlier today that Intel's new Core micro-architecture would support the fusion of x86 instructions as well as micro-ops, which should increase the efficiency of the CPU as well as help to reduce power. 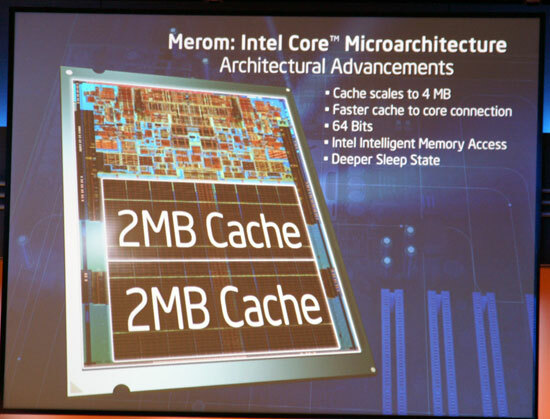 What hasn't been talked about too much is Merom's 4MB on-die L2 cache. Merom's cache, like Yonah's, is entirely shared between the two cores and can be dynamically resized to suit the needs of each individual core. The increase in L2 cache size from Yonah's 2MB now explains why Yonah had a higher L2 access latency (14-cycles) compared to its predecessors; the higher latency L2 is actually because Yonah makes use of Merom's cache, it simply is a 2MB version of it. 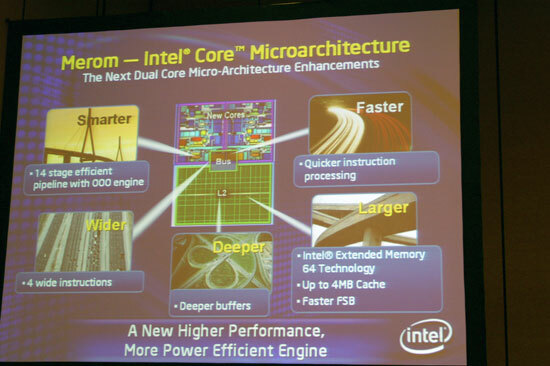 Merom will make its debut in the second half of this year on a platform Intel is referring to as the Napa Refresh. The new platform is essentially Napa, but with a Merom processor instead of Yonah. The other beauty of Merom is that it is 100% compatible with existing Yonah designs, meaning that all Core Duo notebooks today should be able to accept a Merom processor with at most a BIOS update. Did you guys read that? That means Memron notebooks day one - at theoretically no price increase. sigh I know - all in time right? Still wish it was right around the corner.